This set contains 12 notecards (4x6 inches), 4 each of 3 different designs, and 12 signature tan envelopes in a keepsake tin box. 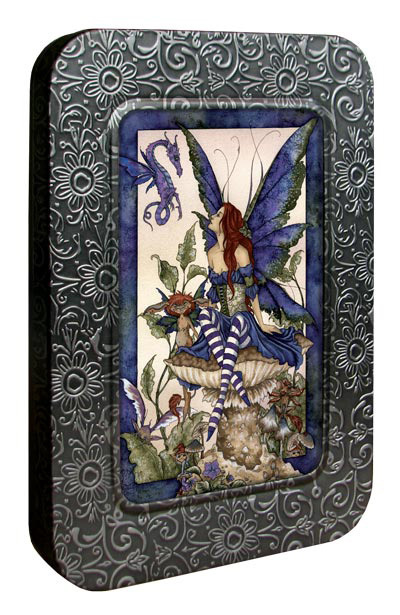 The tin box features an elegant, raised (embossed) pattern and may be reused as a keepsake photo frame. Frame features a plastic sleeve to hold a 4x6 inches photo. Frame opening is 3.25 x 5.25 inches. Tin dimensions are 5.375 x 7.5 x .75 inches. Reusable tin is made from recycled steel. Cards & envelopes are made in the USA. Cards are made with 100% recycled paper, with a minimum of 50% postconsumer fiber. 100% postconsumer waste recycled envelopes. Paper printed with soy based inks.